A website inventory. If you haven't created one already, please see our Create a Website Inventory guide before continuing. A Google Merchant Product Feed. If you haven't created one already, please see our Creating a Google Merchant Product Feed guide. What is a Google Shopping Campaign Ad Build? A Google Shopping Ad Build is a series of Google Shopping campaigns, ad groups, ads and product groups which Ad Builder generates and subsequently publishes to your Google Ads account based on your website inventory. Once published, Ad Builder will update your Google Ads content whenever your inventory is updated. This means keeping your campaigns, ad groups, ads and product groups up to date and in sync with any changes to your website. What Will My Shopping Ads Look Like in Google? When a Google Shopping campaign is combined with a Google Merchant Center Product Feed, all the individual products on your website will be advertised in Google as Product Shopping Ads. Create a Google Merchant Product Feed! In order to generate, publish and advertise your products in a Google Shopping campaign, you first need to create a Google Merchant Product Feed. If you haven't created one already, please see our Creating a Google Merchant Product Feed guide before you proceed. To create a Google Shopping Campaign, navigate to your website overview page, select the blue + icon from the bottom right corner of the page and click Google Shopping Campaign as shown in the image below. Login to the Google Account linked to your websites Google Analytics account. Once logged in, select the appropriate Analytics account from the dropdown. Enter a name for your Ad Build. We recommend selecting a build name which will help to identify your build if you choose to perform multiple builds. For example you may include the target country or currency in your build name. Enter your AdWords Customer Id. If your Google Ads account is not yet linked, Google will send an email to the address linked to your Google Ads account requesting permission for Dynamic Creative to link to your Google Ads account. Accept this link and click next. If your Google Ads account is already linked to Ad Builder then click next to proceed the next step. If you have already linked an AdWords account with Ad Builder on another build, click ' select from existing publication accounts' option and choose the AdWords account from the dropdown which you would like your generated content to be published to. When ready, click next to proceed to the next step. Enter your Merchant Center Account Id. If your Merchant Center account is already linked to your Google Ads account then click next to proceed to the next step. Sign into your Google Ads account. Under “Setup,” click Linked accounts. Under “Google Merchant Center,” click Details. Find the Dynamic Creative link request. The “Status” column will say “Pending.” Click View details in the “Actions” column and review the request details. Click Approve to approve the link. Once your Google Ads and Merchant Center accounts are linked, click next. Select the inventory which hosts the products you would like to advertise. Enter a default Bid and Budget that will be set on all your generated Google Ads content when published. Note: Once your content has published for the first time you cannot adjust the bid and budgets of your content from Ad Builder. Bids and Budgets should be managed within Google Ads once your content has been published for the first time. When ready, click save and generate to queue your build for generation. Ad Builder will then build all your campaigns, ad groups, ads and product groups and prepare them for publication. On your website overview screen you will now see a new Google Shopping Ad Build card. This card will update with the number of campaigns, ad groups, ads and product groups that have been generated by Ad Builder. When generation has complete, the Last Generated value will update and you will be able to proceed with publishing your content to Google Ads. Note: Saving and Generating does not publish anything to Google Ads. Ad Builder first generates your content and stores it in your account for you to preview and edit prior to publishing. For steps on publishing your build, see our Publishing your Shopping Build guide. 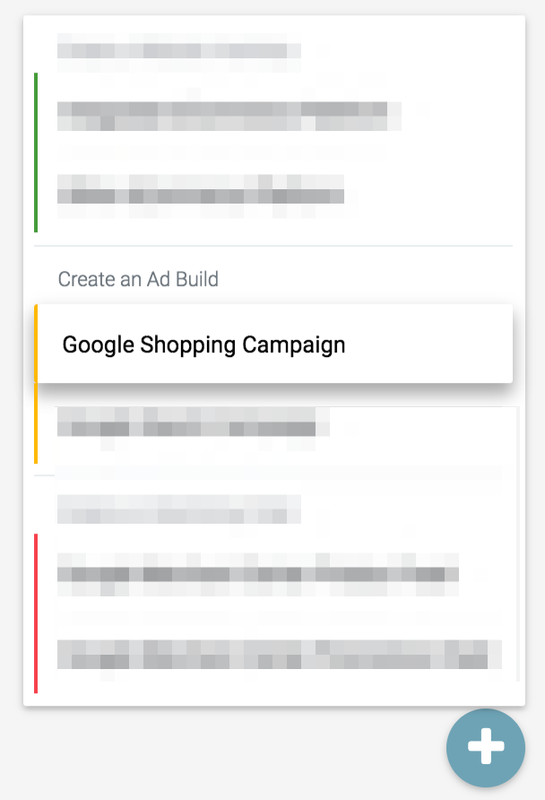 Note: The publish icon on your Google Shopping Ad Build card will not be available until your build has fully generated. You can use the Last Generated time to see if you build has completed generation. 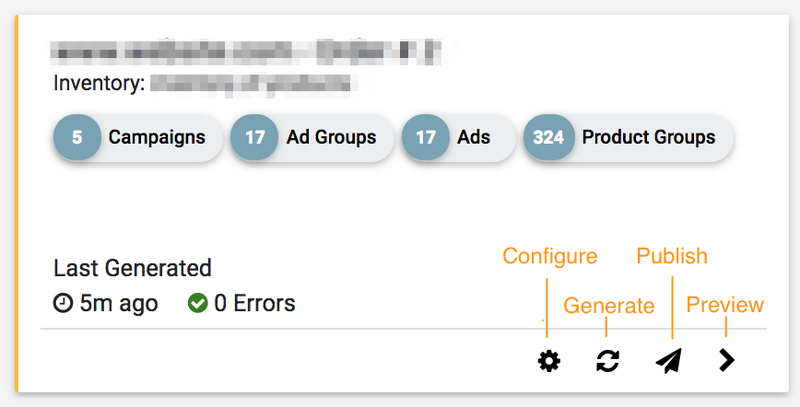 Once your build has finished generating you can preview your Ads, make adjustments to your Ad Build configuration and finally publish your build to Google Ads. For steps on publishing your build, see our Publishing your Shopping Build guide. In order to advertise your products in Google you will need to upload a Google Merchant Product Feed to Merchant Center. For steps on creating and uploading a Google Product Feed see our Creating a Google Merchant Product Feed guide.